Omnivores eat both plants and other animals. 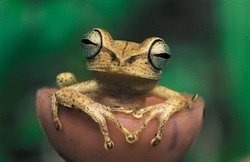 Many monkeys, tree frogs, and birds are some of the omnivores that live in the Amazon Rain Forest. Toucans live in the forest canopy. They eat tropical fruit, spiders, lizards, frogs, snakes and even plunder nests of smaller birds, taking eggs and nestlings. Lives in semi-open habitats and spends much of its time on the ground searching for small fruits and insects. Eats a wide variety of fruits, berries and insects, as well as leaves, flowers and nectar. 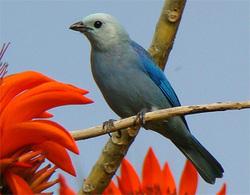 These birds play an important role in seed dispersal for trees and shrubs in the tropics. Predators include Amazon cats, snakes, birds of prey and crocodilians. Other predators, such as raccoons, eat young birds and eggs. 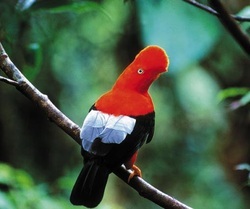 Habitat destruction due to deforestation is a primary threat. 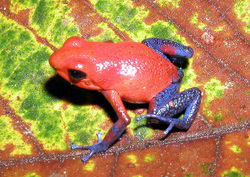 They live in the upper levels of the forest canopy. They live in the Canopy and Understory forest layers. They eat mostly fruit and insects, although sometimes they also eat small vertebrates such as frogs or lizards. They are one of many species that have been seen following army ants. They are eaten by hawk-eagles, hawks, forest-falcons, Jaguar, Puma, Ocelot, and the Boa constrictor. They sleep by day stuck to leaf-bottoms with their eyes closed and body markings covered. Nocturnal carnivores, they hide in the rain forest canopy and ambush crickets, flies, and moths with their long, sticky tongues. Eaten by birds, snakes, and lizards. 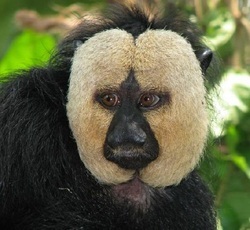 A small, common monkey, found throughout western Amazonia. They feed on fruits, insects and flowers. Living in the leaves and plants on the floor of the rainforest near streams and rivers. They eat termites, crickets, flies and ants. Very colorful and very toxic and dangerous for people. Its venom is not only dangerous but is also useful in medicine as scientists found a few years ago. They quietly roam around the middle canopy in small groups, looking for fruits, seeds, leaves and also insects. The most common Amazon monkey, widespread throughout the rainforest. They roam around the tree tops in large troops of 20 to 100, making a lot of noise! They like the river edges and lake sides, where there is lots of vegetation with vines and lianas. They feed on small insects and fruits, and like to tear up flowers to get at the nectar. Found along Amazonian rivers. They commonly sit on logs sticking out of the water and dive into the water once approached too closely. 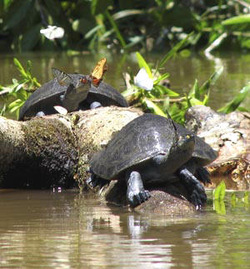 The Giant Amazon River turtle eats fruits, leaves, plants, and insects. They don't have many predators. Jaguars and Black Caimans are the only animals big enough to eat them. This turtle is prized for its delicious meat and their nutritious eggs. They are endangered. Conservation efforts are undertaken now to protect them. Lives in the forest canopy. Eats insects, flies, and moths.